Is College the Only Path to Success? These are very successful people without college degrees. Pursuing your dreams may not take you through a traditional path. Follow your passion, blaze a new trail, build your dreams. Thank you to http://www.accreditedonlinecolleges.net/ for sharing their very powerful info graphic. The choice of type is an important decision. Type conveys the flavor of your message when you are sharing your words in print, on a computer or smart device screen. I am especially sensitive to the look and feel of type. I own more than 1000 fonts, so many that I recently had to disable many of them to avoid slowing down my computer. My fascination with the structure and beauty of typography began over 30 years ago. You can see examples of type as a branding element when you go to the grocery store. Some of the most famous examples of typographical branding include Coca-Cola, Pepsi, CBS, Jack in the Box, Costco, Macy’s and Target. They may also use other graphic elements, yet you easily recognize their names when you see them. 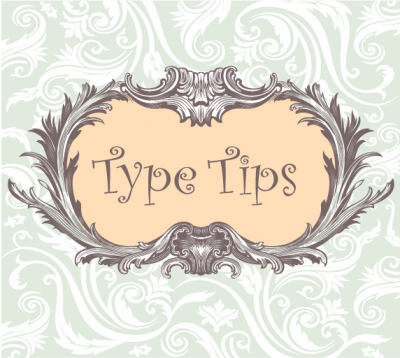 Typography can be used to make your point, evoke strong feelings, act as a focal point to draw your attention to what is important. When used improperly, the choice of type cause confusion, be hard to read, or convey the opposite meaning from what is intended. In my opinion, and one that is shared by most designers I know, one of the best books ever written about typography is a very small volume written and originally published as a handout for the graphic design special interest group of the North Coast Mac user group. I’m talking about “the non-designers design book” by Robin Williams. The companion book, “ your Mac is not a typewriter” is equally valuable and well known. They were written at the start of the desktop publishing revolution and the wisdom is just as valuable today. The principles of good design haven’t changed. They methods we use to deliver our message have changed. The principles of good design still apply. I consider these two tiny books to be a “must read” for anyone who intends to use words in a visual format to communicate with others. You can find books through Peachpit Press (members of the North Coast Mac Users get a significant discount and can order then at a meeting — go to www.ncmug.org for details.) I first started using these books when I was a student in the graphic arts program at Santa Rosa Junior College, and again when I began teaching graphic design and communication. I was extremely fortunate to meet and learn from Robin. We met when she was a part-time instructor at SRJC and as a frequent presenter at the NCMUG graphic arts group. Robin is a very witty and dedicated lover of typography. She went on to take her workshop handouts and transform them into these books. Since that time, she has written many more excellent books on design, also available through Peachpit. Generations of graphic artists everywhere are indebted to her for these clear, visually powerful and fun books that are good foundation for professional, digital, typesetting. There is no excuse for poorly executed typography when we have so many powerful tools and an endless inventory of type available to us. Back in the days when type was set by hand withi lead type, writers never thought about laying out their words for print themselves. They concentrated on their stories and left the typesetting to the experts. Today most of us use a computer to compose and to prepare our written words for publication. Owning a computer does not a typographer or graphic designer make. If you intend to enhance your message and share it, educate yourself about type or collaborate with a trained, professional book designer to transform your words into beautifully set type. Spend an afternoon becoming familiar with the content of these two books. I guarantee your investment will be rewarded. Even if you have no interest in doing it yourself, becoming an informed consumer will help you direct your book cover designer, your book interior designer and your e-book designer with the information you need to make your writing as beautiful and as memorable as your writing. Judy Baker is Completely Creative. Trained and certified by Robert Middleton as an Action Plan Marketing Coach. She is a branding expert who helps authors, speakers and entrepreneurs and create visual and verbal brands that attract customers. She specializes in developing brands that connect emotionally and move people to take action. An alumnus of Robert Mondavi Winery, Judy is an engaging speaker and workshop leader. A graduate of San Diego State with a B.A. in Drama and a Master in Human Resources and Organization Behavior from the University of San Francisco, she has been a student and instructor in graphic design at Santa Rosa Junior College. My writing coach told me about Scrivener. It is made by Literature and Latte. It is a great tool for writers of all types. I am using it to transform my book outline into a manuscript. Scrivener is a flexible tool and you can start with an outline, or just jump in and start writing. Without any instruction, I got going in less than five minutes. I am a long time user of Microsoft Word, InDesign and other document creation tools, so I am relatively fearless when it comes to software and putting it through its paces. There is an introduction video tutorial, so you can learn how to use it in under ten minutes. It is well worth your time to view this video as shows you how to navigate the interface of the program and gives you tips on how to use it. Of course, I didn’t watch the video first, I just dived right in and figured out how to do things. To really understand the framework, I recommend that you check out their overview tutorial and avoid frustration. I downloaded a free trial version of Scrivener. I wanted to be sure I would enjoy using it before I bought it. Scrivener is available for the Mac OS (that would be me) and for Windows. Their trial terms are very generous. You can use the program for 30 days. However, if you only use it for 1 or 2 days a week, you can stretch out your evaluation period. I bet you won’t wait long before you decide to buy a license and continue to use it. It is a desktop only app for now, with an iPad version in the works. I was convinced that this is a tool I will use after I got started on my first project. It is similar in some aspects to Evernote, one of my favorite applications. They both organize your stuff. They both use folders. Just as Evernote is great for clipping content from the web, you will soon find that Scrivener also has the ability to capture your data. You can import or drag and drop files into your project. If you are a new author or a seasoned pro (both use Scrivener), you will soon discover that preparing your content for publication is as much file management as it idea generation. That is where Scrivener shines. You can organize your thoughts in a variety of ways. If you are old enough, you remember putting your ideas on paper index cards. Scrivener uses this concept and assigns an index card to every document in your project. Projects are contained within Binders. You can work on individual sections of your writing and rearrange them easily. No more cut and paste. You rearrange the index cards in your project until you are happy with the order. Or if you prefer, you can view your content in outline mode. You can switch back and forth between modes too. There is another mode, scrivening, where you can see the entire contents of your binder as if it were one long document. Download Scrivener and try it for yourself. The trial runs for 30 days of actual use: if you use it every day it lasts 30 days; if you use it only two days a week, it lasts fifteen weeks. Once the trial expires, you can export all of your work or buy a licence to continue using Scrivener. The idea is that you create projects, projects contain binders, binders hold folders and documents/index cards. You can make your chunks of writing as small or as large as you wish. If you decide to split a chunk, Scrivener can do that in one mouse click and your larger chunk becomes two separate document. This is an area of the Project where you can put anything, such as images, notes, anything you are using as you prepare your manuscript, but the content of the Research area is not compiled into your book unless you copy the contents onto an index card. research all stays in your project. It is easy to add documents into any part of your Project. You can import them, including Microsoft Word files. You can drag and drop them into your Project. You may clip information from the web into Scrivener. Instead of guessing where you filed those documents that make up your project on your computer, Scrivener keeps track for you. I love this feature. I don’t have to remember where things are living on my computer, especially when I may be using content from a variety of sources. Once I put it into Scrivener, it is just a click away. I haven’t tried this yet, but my writing coach has already used Scrivener to publish her work to a variety of e-pub formats. Scrivener has the capability to compile your writing into the various flavors of e-pub, and you have control over what goes into each publication. You can also expert to many popular programs like Microsoft Word or create a PDF. There are templates included as a starting place for you. The program is very flexible. You can watch video tutorials to help you learn how to use the program. It may take you a bit of time to use all of its features, and some you may never use, depending on your genre. You can get started fast if you already are familiar with Microsoft Word or Open Office. And, it is very inexpensive to purchase, under $50. I give it five fountain pens.